Emmental (pronounced "EM-en-tall") is a type of Swiss cheese made from whole cow's milk. Because this medium-hard cheese takes its name from its homeland in Switzerland, you might see its name as Emmenthal in recipes and more modern cookbooks, or as Emmentaler or Emmenthaler. If you're a purist in your buying habits and see the cheese as Emmentaler Switzerland, you can be assured you're getting the real thing from Switzerland. Although it is named for the Emme River Valley, where it was originally made, Emmental cheese can be made anywhere. France and Germany are big producers of Emmental. In the United States, while you can find Emmental cheese labeled as such, you may know it by its more familiar name: Swiss cheese. Some specialty cheesemakers are unwilling to break with the traditional methods of making Emmental, even importing the vats they use from the cheese's home canton. Emmental is a firm cheese with a pale yellow color and a buttery, mildly sharp, slightly nutty taste. Emmental features the characteristic holes or "eyes" typical of Swiss cheese. 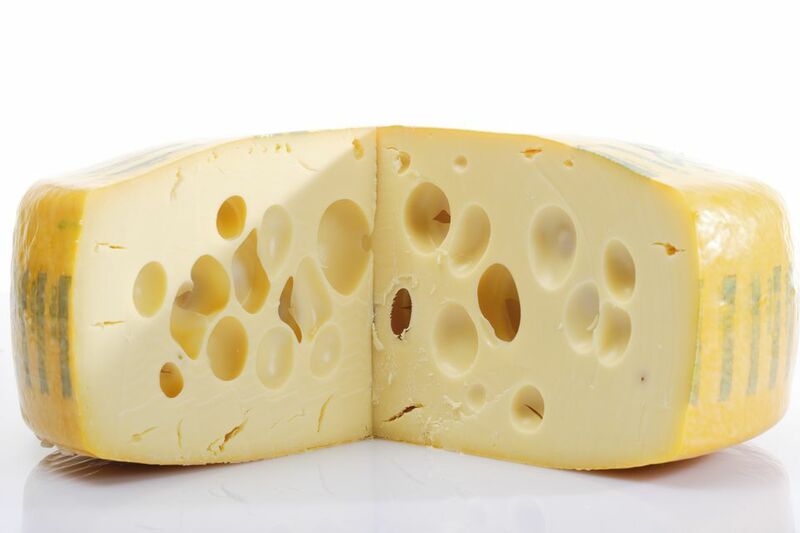 The holes in Emmental are formed by gas bubbles released by the bacteria that are used in making the cheese. Because it melts so well, Emmental is frequently used in sauces and grilled sandwiches. Emmental is one of the two main kinds of cheese (along with Gruyère) in a traditional fondue recipe. Of course, you can dress up your favorite mac-n-cheese recipe by using Emmental. Don't neglect the idea of using this Swiss favorite just as it is, sliced off the cheese wheel. Try serving your Emmental with wines; it goes particularly well with a Merlot, a Reisling, Beaujolais or Champagne. If you're a beer drinker, you might want to try a Belgian beer, a light lager, or a stout to complement the slightly fruity taste of your cheese. Pair your fresh cheese with apples, grapes, peaches, and pears on the cheese tray. You can even use the flavored crackers; they'll stand up well. Emmental cheese can be stored in the refrigerator for five to six days. But if you wrap it properly—insert parchment between slices and then wrap the entire package loosely in plastic wrap—it will last a tad longer. For chunks of cheese, wrap it tightly in plastic wrap. Keep an eye out for mold. If you see any, toss the whole thing. Keep your refrigerated cheese in the cheese compartment or even the vegetable drawer, but far away from pungent herbs or spices. You want to taste the cheese, not garlic or onion. Grated Emmental can be frozen and successfully stored for up to a month. Make sure you remove the air from the storage bag. No matter how you store the cheese when you serve it, you want your cheese at room temperature. So give your cheese time to warm up before you serve it to your guests or use it in your recipe. A Reuben sandwich made with real Emmental cheese is a giant step up from the ordinary. Not only is the melted cheese creamier, but the taste is also just a bit more fruity than conventional Swiss cheese. For a continental twist, layer your cheese with thick slices of your favorite ham and put the two foods on multigrain bread, sourdough, or pumpernickel with mayonnaise or dijon mustard. Butter the bread and heat on a griddle.Ooh, la la. Have the World's Best Artisan Cheese Delivered to Your Door!